Lapua's name is synonymous with quality, accuracy and performance in the ammunition world. This high end 338 Lapua Magnum cartridge is crowned with Lapua's standard bearing Scenar projectile. The 300 grain Open Tip Match Scenar bullet resume is chalk full of world records in many different competitions. This is truly a precision round for the precise shooter! The Lapua cartridge factory was established in 1923 from a modest and practical beginning. Lapua has grown into one of the most respected brands in the industry. Some of the best shooters in the world choose Lapua cartridges. 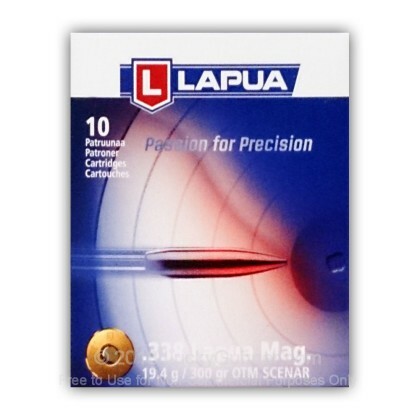 We don't have any reviews yet for this particular .338 Lapua Magnum ammo from Lapua. If you'd like to be the first to review this particular .338 Lapua Magnum ammo from Lapua, fill out the form below.